I'm mostly using GIMP to cut, scale and save images for my web page, and using the save for web pluging all the time for evry image. It seems that the savee for web plugin is not supported under GIMP 2.1x. Yes, I know that you can do the same operations with other tools, but it is far more work intensive and without the "save for web " plugin, I will have to eiter abandon gimp, or revert to previous gimp 2.8x version. If you are an artist, the "save for web" pluging might not be vert important, but for me, using gimp for preparing images for my websigte, it is the most important feature. After reading the forum, it seems that no one plans for making the save for web plugin work under 2.1x ?? so my question is: how to revert to the latest Gimp 2.8x and the save for web when running Xubuntu 18.04 and prevent gimp to be upgraded to never versions in the future ? I do not have a xubuntu handy to check what is/isn't installed/available so you will have to give a few details of what is installed. I have never known a linux distro "just upgrade" a package without some sort of user intervention. 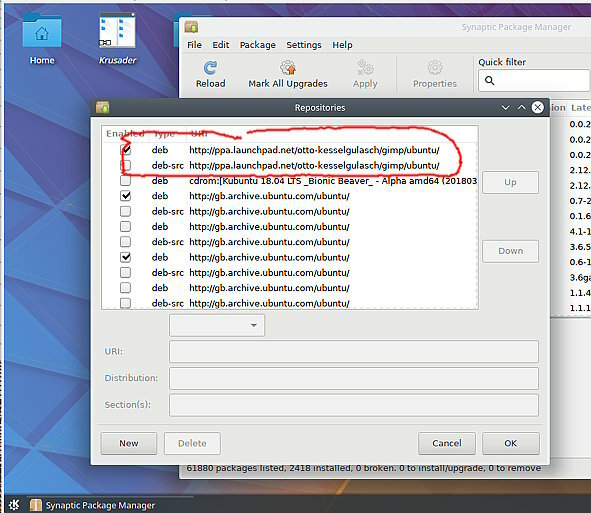 Have you asked about this on a xubuntu forum? Unless you are using a flatpak/snap/appimage version Gimp 2.10 comes from the otto-kesselgulasch/gimp PPA Did you enable this sometime? Sometimes possible to force an earlier version: https://i.imgur.com/pOAX0qY.jpg but better to uninstall the Gimp 2.10, disable the PPA. Be thorough with Gimp. Go through the list of packages missing one can lead to 'broken packages' annoyance. (02-06-2019, 02:02 PM)rich2005 Wrote: I do not have a xubuntu handy to check what is/isn't installed/available so you will have to give a few details of what is installed. Gimp 2.8x was installed before and worked perfect. Today, during normal system upgrades, GIMP version 2.10.8 showed up - DAMN,,, without the save for web pluging, GIMP is useless for me. Quote: .. I will have to eiter abandon gimp, or revert to previous gimp 2.8x version. 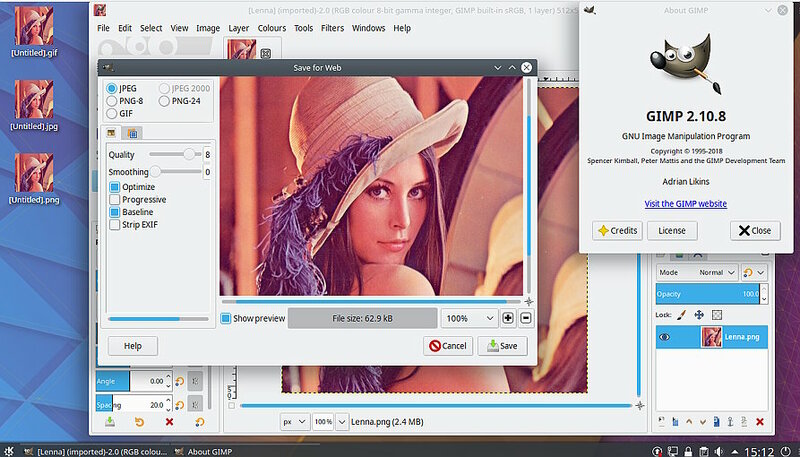 Save for Web (webexport plugin) is not going to work in Gimp 2.10, it will need a code re-write and for example, one format jpeg2000 is no longer supported. What format do you use most? Do you use the scaling options? Is it just to check the file size? 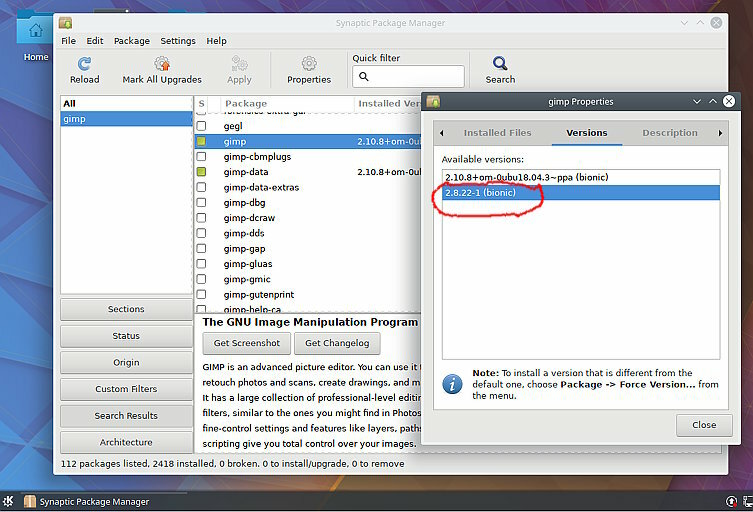 For Gimp 2.10 (and Gimp 2.8) there is the preview option that shows file size. It is not a problem - I pointed out what you will need to do to revert to Gimp 2.8 from Gimp 2.10. This in a kubuntu 18.04 Gimp 2.10.8 and webexport is working as good as it ever will. Where did you get the webexport plugin from? Was it the bloody awful gimp-plugin-registry package or was it one that I posted? If nothing shows (not the same as does not work) then the Gimp update might have dumped it. I think it has been dropped from the gimp-plugin-registry package. Try the attached. Unzip and put in the Gimp 2.10 user profile ~/.config/GIMP/2.10/plug-ins Check that it is executable.